To the best of our knowledge, this would be the first Hyperloop route in the UK. It’s such an unusual one, we thought worth sharing with you, even if off-Island. 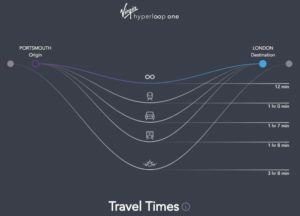 To give it an Isle of Wight context and an understanding as to quite how fast a Hyperloop would be, Hyperloop One estimate it would take 12 minutes to travel from Portsmouth to London (graphic). OnTheWight has tried to contact Cllr Kendal and Virgin Hyperloop, but haven’t heard back at time of publication. A 200mph train-line could be operating in Hampshire in as little as five years, a county councillor has revealed. The Virgin Hyperloop One high-speed rail network would link Basingstoke with Woking, says Cllr Mel Kendal, county council cabinet member for economic development. While referring to an unnamed UK-based firm working with Virgin, the New Milton ward member said that meetings had taken place with the council regarding construction to be undertaken on land in the north of the county. However, while speaking at the Buildings, Land and Procurement Panel meeting, he added the land in question was owned by a trust, sparking doubts about the scheme. Nevertheless, the firm is alleged to be getting government legislative backing to push the train-line plans through, which it wants to go all the way to Heathrow, London. The Conservative councillor, who branded the idea as “exciting” for the county, also revealed that the tunnel will be carved by a Chinese firm. 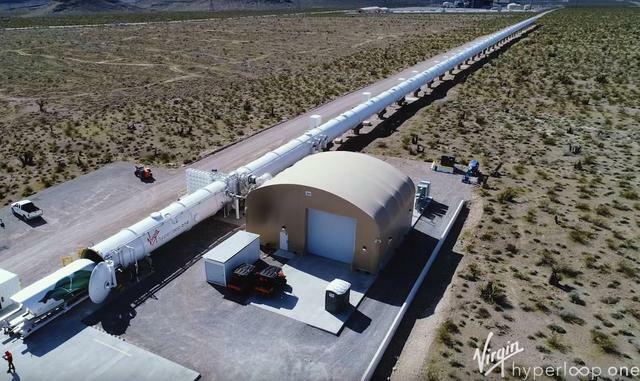 Once completed, Hyperloop will be used to transport both passengers and freight, claims Virgin. It will be powered by electric propulsion through a low-pressure tube; the vehicle will float above the track using magnetic levitation and glide at airline speeds for long distances due to ultra-low aerodynamic drag. It will also be fully autonomous and enclosed, eliminating pilot error and weather hazards. Hampshire County Council refused to comment, and Virgin did not respond in time for publication. The news comes almost a year after it was revealed Virgin were also looking at creating a route between London and Edinburgh – which it claims would take just 50 minutes. The firm, owned by Brit-mogul Richard Branson, recently conducted overground tests in the Nevada desert, USA where it was able to reach speeds of 196mph. Elon Musk, who owns Tesla, is another trying to utilise the underground having already carved tunnels under Los Angeles. He originally claimed his hyperloop concept could one day reach speeds of 760mph. Musk’s recent tests have seen his design reach 220mph – the current fastest speed. Isle of Wight specific, added by OnTheWight. 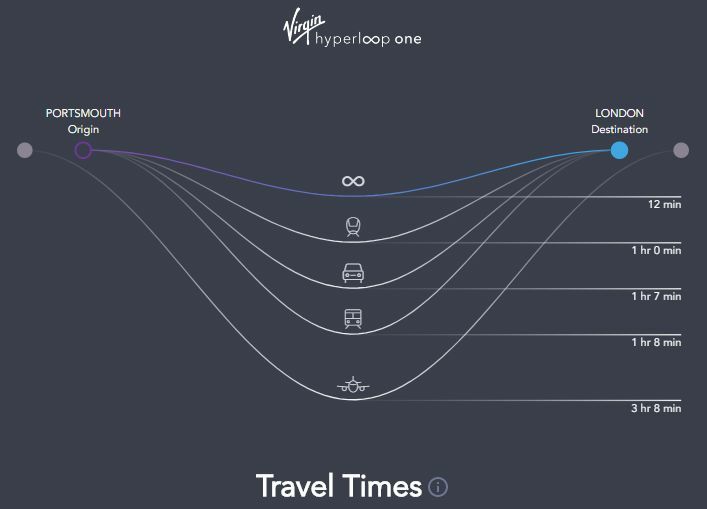 Below is an estimate from the Hyperloop One Website, showing their estimate of how fast it would travel between Portmouth and London, if such a line were to be created. We tried Basingstoke to Woking, but it wouldn’t recognise Basingstoke. 3 Comments on "First UK Hyperloop One Basingstoke to Woking? Route under discussion says Hants Councillor"
Hey! 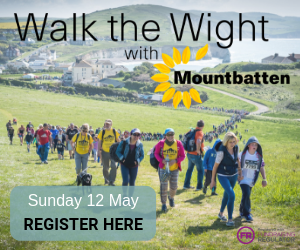 That’s perfect for Portsmouth to the IOW somewhere…. crossing time 1.5 mins or less.Someone call Branson quick.